You don't have to follow the yellow brick road to find this emerald jewel. All kinds of gorgeous greens fill this 10" basket that makes a perfect sympathy gift. So beautiful and bountiful it will deliver your condolences eloquently. 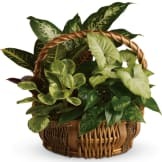 • Pothos, nephthytis, dieffenbachia, croton and peperomia plants are perfectly arranged in a distinctive 10" willow rope basket. • This sympathy basket will be hand designed and delivered by a local florist. • This arrangement measures approximately 17 1/2" W X 17 1/4" H.
Flowers will be received by a Green Hills Mortuary & Memorial Chapel's staff. Thank you for having a variety of items to offer. 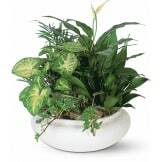 The plant arrangement will "love" for long time with gentle thoughts. Dar! The plant was perfect. It was easily notable that the large majority of flowers at the funeral came from your shop and they were all just outstanding. Thank you for making my purchase experience totally painless. Viewing the basket online it looks full and pretty. When I arrived at the funeral of a close friend I saw that although it was pretty it was not full and as I expected. The family liked the basket but I was a bit disappointed. For the amount I had to pay it seemed to just lack the full overflow of plants. I gave it 4 stars because even though it seemed skimpy it was pretty and the family liked it. While the content of the basket was lovely, I was a bit disappointed with the delivery - I had requested it be delivered on Sat and when I arrived on Sun afternoon it was still not there. I was appalled when my basket arrived as I was speaking with one of the family members. Even after contacting your service earlier on sunday and being assured it would be there by three o'clock - it arrived at about 3:30 - over 24 hours after I had requested it. The basket was very nice though. The basket was very nice ! Appreciate your help. The family I sent this to loved it. 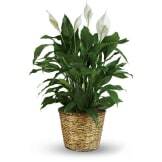 I didn't get to actually see the plant, but from what I've heard the recipient really like it, and appreciated it. I had flowers delivered to our family out of state for a funeral. A family member sent me a picture of the arrangement that was ordered and delivered, since I was unable to attend funeral. The arrangement was beautiful. The plant was a very appropriate choice for a funeral. Fresh and a long lasting gift too which is nice. All of our flowers are designed and delivered by hand from a local florist in in Rancho Palos Verdes.